Battery is one of the most important aspects which most people ignore while buying a new SmartPhone. Battery life is very much a important factor as the display and chipset of the smart phone do. 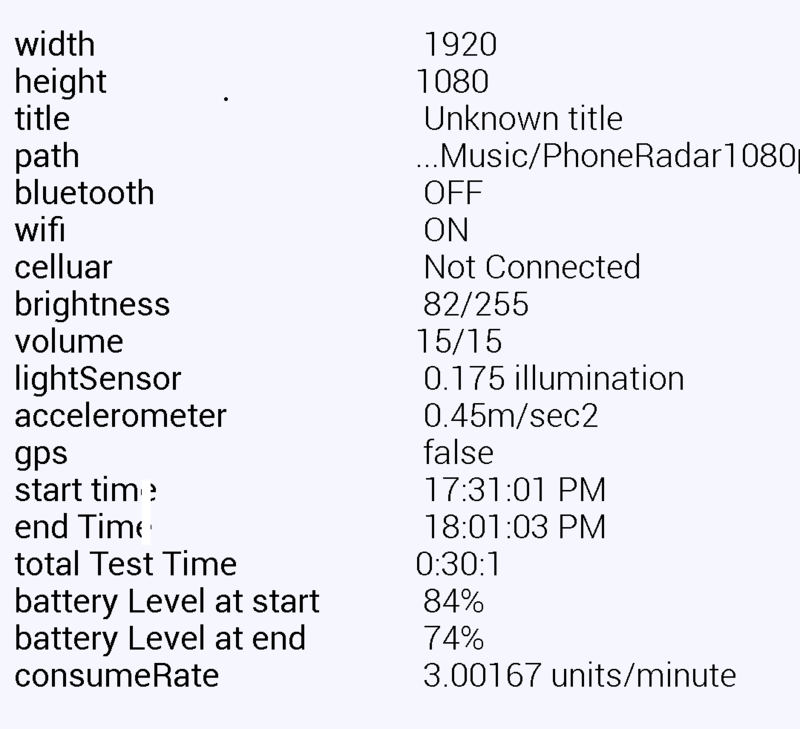 More the clock speed and cores, more the battery is used. Although Smartphones are smart enough to adjust the speed according to the task we also need to know how much battery it uses for our regular usage. Well today we would like to put forward the results that we have got from the Nexus 5 battery test that we have been performing from few days. 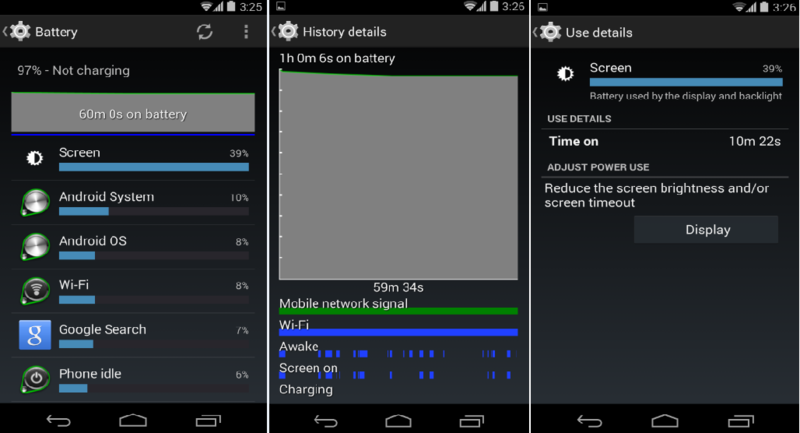 This battery test is done considering all the aspects of the users as some like to browse most of the time on the device, few like to listen to songs / watch videos and others like playing games. 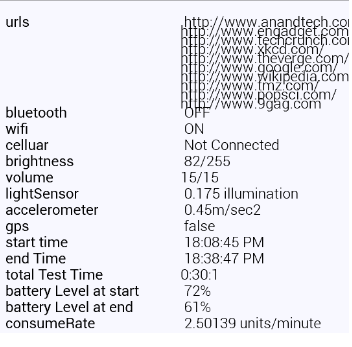 Each test is done on the LG Nexus 5 that has a 2300 mAh battery and all these results are given below in detail according to the usage. Note – These tests are done with the maximum volume, Wi-Fi Switched on, brightness levels-medium and few application’s running on the back ground (Dalvik run-time is used). More over there might be a few minute changes in the results that you get with your device and we are not responsible for the difference in results. Music is almost a part of living and every one listens to it, be it while Working, Eating, Running, Walking, Playing or while in Gym. Everyone has a different choice of music so they dump their favorite play list and start listening to it. 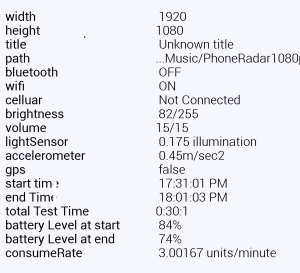 From our test we can easily find out how much of battery is consumed while you are enjoying the music. We have played the music for half an hour and the battery utilized was 3%, out of which 31% was utilized by screen and and 30% was utilized by Google music play. 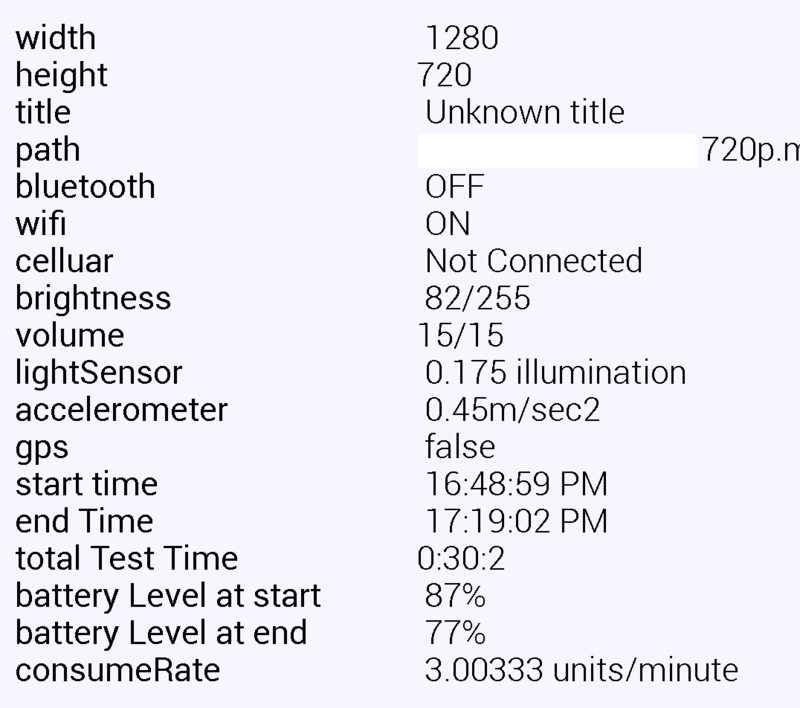 With this rate the battery of the device is will die after 16.6 hours. The video playback test on the Nexus 5 is done with two different video qualities, one being a 720p (HD) and another was 1080p (FHD). Below table gives the results of the same. The results after 1 hour of continuous playback shows that the battery was down by 20% and the consume rate was 3.0033 units/ minute. With this rate your battery will become dead after 5 hours of continuous HD video play. Clearly illustrating that you could watch two to three movies on your smart phone before it goes out of its charge. Full HD Video playback drained the battery by 20% after one hour and the consume rate was the same as it was in the case with HD playback. The battery will become zero after 5 hours of FHD video play clearly depicting that there was not much difference in the discharge and you can get a total of 5 hours usage while enjoying the medial files. In this busy schedule, you always cannot turn to your laptop or system to browse the internet, now a day’s almost everything is done through internet from ordering a pizza to booking a flight ticket. You will also browse on the phone while you are walking or sitting alone down the street, chat with friends, read news and all the happenings round the world. The thing here is to know how much battery is consumed from it and plan accordingly when you are low on battery. Our experience with browsing on Nexus 5 was pretty good, we went ahead and browsed for 30 minutes and the battery consumed was 11%, draining the battery in 9.09 hours and the consume rate was 2.50 units/minute. Gaming was one of the interesting parts of the review, as it was more fun compared to other tests that we have done on the device. We know that the Nexus 5 is Google’s one of the very few devices that run Stock Android version. The handset supports almost all the Games and Apps on the play store and it was time for playing some high quality game that can take some real power from the battery. After 30 minutes of gaming, we found that the battery was down by 14% which is around 28% in an hour. Considering this rate the phone is expected to last for not more than 3 hours along with which the screen usage was attributed to around 35% of battery consumed. Major part of the phone that you are using will be idle condition and even while you are doing nothing with the device these is some part of the battery drain. This Normal usage is considered when you use the smart phone for some random calls, reading the notification and messages. It is important to know how long your device can last while you are using it normally. 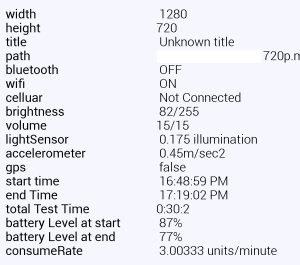 After 30 minutes of normal usage, the battery of the device was down by 3%, i.e. if you use this device normally, the battery will last for 16.66 hours. This is pretty low battery back up considering the normal use with the Wi-Fi switched ON and normal brightness. This is very much poor but we can expect this from Nexus 5, because of its powerful hardware and the sensors running on it. After all the results from the graphs and stats that we have we can say that the battery life of the Nexus 5 is quite good for media consumption, average for gaming and better for normal usage. If you are a person who browses a lot of web and uses the device more for media related activities then its recommended for you.